The Alaris Auto-ID module 8600 incorporates bedside IV barcoding, independent of facility broader barcoding or IT strategy, attaches directly to Alaris™ System, the device confirms patient, clinician and drug information and allows infusion programming on the same user interfaceas it conveniently captures the patient ID and medication barcode with Alaris ™Auto-ID module handheld scanner. Based on years of experience in developing products for the point of care, the Alaris™ Auto-ID module helps streamline clinical workflow by providing confirmation of patient, clinician and drug information and recognition at the point of care, ultimately helping to keep your patient safer and make your job easier.Simple to use and a must for every clinician who desires accuracy and reliability. 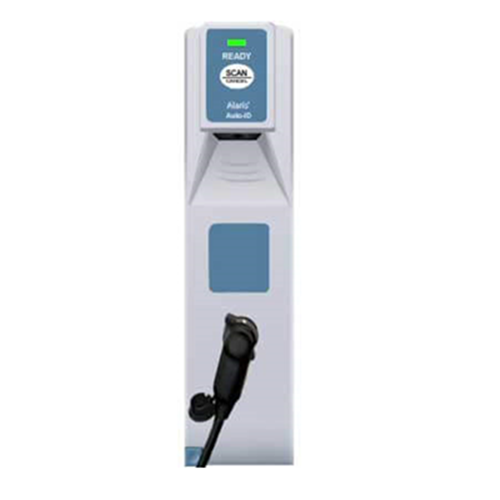 The system allows hospitals with or without a wireless network or bar-coding system to benefit from the added safety of bar coding for IV therapy, and it helps reduce IV-programming errors. The Alaris ™Auto-ID enables the inclusion of patient and clinician identification in continuous quality improvement data captured at the point of care.